The ability to absorb force when stopping is just as important as your ability to explode back in another direction. Adding drills that enforce good landing mechanics as well as increasing general leg strength can decrease knee injuries and increase speed to the net. Straight ahead speed is great, but very rarely does a player get an open field for very long. Focusing on exercises in the weight room that develop an explosive start and acceleration will make a difference on the score board. 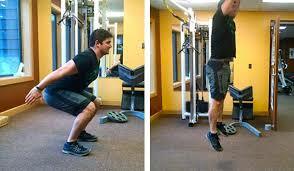 Front squat from a rack placed at the bottom of an athletes squat position are a great addition.